Der Artikel A Place to Call Home Season 1-6 (UK Import) wurde in den Warenkorb gelegt. Drama / TV-Serie, 3015 Min. 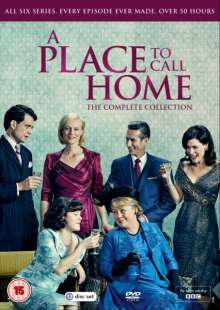 All the episodes from the first four series of the Australian drama set in the 1950s, starring Marta Dusseldorp and Arianwen Parkes-Lockwood. When Sarah Adams (Dusseldorp), a mysterious woman who has spent the last 20 years abroad, receives tragic news from her family, she begins her journey back home to her native Australia. As she gets to know the wealthy Bligh family, her life begins to change forever.